CTA has solicitations for 261 color LED signs, 261 HVAC units, and 261 Auxillary Power Supply units. Since the number 261 seemed strange but consistent, I cracked open the sign one, which indicates that it is for 3200 series cars. So it looks like they are getting some sort of overhaul, but not the complete one previously indicated. be used for the mid-life rehabilitation of series 3200 rapid transit railcars." The signs are to be controlled by something that looks like the current two knobs. "Each destination sign unit shall include a receptacle to connect a portable test unit (PTU), which shall be a laptop computer. ... "
"4.5.2. The PTU shall be used to download the destination sign's readings." "4.8.2.10 Downloading of software updates to each system." So they aren't programmable, are they? This spec does say to start off with the 45 readings already in the 5000s. I think they should leave the 3200's with the Mylar Curtains. Then they'll be know as the last of the "L" cars with the Mylar Curtains, which might get IRM to save a pair or two when there retirement starts around 2021(30th year of service). It doesn't look like there going to be changing D/C to A/C. So if they have 45 readings in the #5000's, there should be plenty of space for extra signs. I wonder why they ordered 261 sign kits when they only have 256 #3200 cars. Some extra kits to test on the #2600's? The assumption on 45 readings was that each box would have 3 times the existing 15 signs per mylar roll now, based on 3 different existing mylar rolls (according to the specification). Not exactly sure how that syncs up with that between the two dials there are 15 positions, and the two dial arrangement is to be maintained. As for the other,* I guess one would have to ask Robert Kielba, Chief Rail Equipment Engineer,** as the specs indicate. Maybe you can ask under the name Malcom T [for Twinvision] Luminator III. * As I noted above, the 3 sets of solicitations, not just the signs one, were for 261 units. **Public information, as I previously indicated. Or maybe they are, isn't that what a power inverter does? It says "auxiliary power supply units." I don't have the gumption to download that spec., too,* but based on descriptions on books, that seems to be what powers stuff like the lights, or the 120 volt AC plug for the vacuum cleaner or people taking the risk of plugging in their laptop chargers. Those aren't run on 600 volts DC, and supposedly not on that being stepped down. *Don't have to, since the public page reinforces that by saying "Furnish and Deliver Two Hundred Sixty-One (261), Auxiliary Power Supply Units with an Integral Three-Phrase Auxiliary Inverter including a Low Voltage Power Supply (LVPS), etc." I downloaded the spec for the aux power supplies. If the CTA would get their act together, and join the late 20th century, I'd paste the relevant bits. They haven't, and the document consists of a bunch pictures of printed and scanned pages, instead of, you know, actual text. The APS is replacing an existing GE unit. (page number d-7, page 81 of 124. Anyone who downloads the proposal will do will to skip the first 74 pages, as it's contract boilerplate.) It appears to serve to provide AC power to run blower motors, AC compressors, auxiliary stuff, the convenience outlets; plus low voltage to run 'propulsion controls, lighting, door, and other low voltage systems ... and a battery charger to maintain correct battery voltage'. It's supposed to provide 50 KVA 230VAC 3-phase supply (that's existing spec) 0.8 power factor (about 40 KW), plus a new 40 amp 120 VAC supply. clearly not going to run the motors, and just a marginal upgrade from what exists. The contract does say they're provided as part of the midlife overhaul. Unless the existing units have started failing, and are hard or impossible to repair, this and the sign bid are pretty good sign the CTA is planning on keeping the cars around for a while. Also, if there was plans to change the 3200's from D/C to A/C, wouldn't they have a solicitation for 261 Alternating Current (A/C) Trucks and Spare Parts? Maybe not exactly written that way, but something like that if they were going to do a power conversion of the railcars. If memory serves, the Trucks are the wheel units circled here. The solicitations are for parts that are to be delivered to Skokie Shops. Usually when there is a fairly thorough rebuild, the cars are sent out to an assembler, such as the 2600s to Alstom, and the proposed, but apparently dead deal for Bombardier to build a factory at 61st St. The motors are installed on the trucks (you can in any book on the L on that, especially those on damaging a whole mess of motors in the 1979 blizzard), but in addition to replacing the motors, they would have to replace the propulsion control unit, including adding inverters (see BusHunter's post above), computers and software. Then, if they were supposed to couple electrically with the 5000s, the trainlines and electric couplers would also have to be changed. The reports at the time was that the conversion would cost about $1 million a car, While there could be debate whether CTA would exercise the the 7000s options as indicated, it isn't going to sink that much money into something that has a projected service life of maybe 7 years. I figure this is a combination of an inference from brownliner's post that certain parts may become harder to replace or have worn out, the speculation about where the 3200s are going to end up if the Orange Line gets 5000s, and the cost just incurred to buy mylar signs being continually repeated if they get shuffled (as indicated by Blue Line signs not being on the Brown/Orange roll). The reports at the time was that the conversion would cost about $1 billion a car, While there could be debate whether CTA would exercise the the 7000s options as indicated, it isn't going to sink that much money into something that has a projected service life of maybe 7 years. Actually, there are Blue Line signs on the Brown/Orange roll. I remember once while on a train, some of the roll signs started rotating for some reason, and I saw the Skokie Swift sign, a Ashland/63rd sign, and a O-Hare sign in blue. That must be the mysterious third roll. But obviously there is a cost to maintaining an inventory of three rolls. I can hope against hope for a interior like this on the 3200's if the CTA really wants to get fancy with their redos. There is talk of taking out the Mylar Curtains for LED Displays, and possibly going A/C with them. I still advocate they should leave them as is, as they will be unique come their retirement in about eight years time, since they will be the final CTA railcars to have Mylar Curtains and D/C-powered trucks. The solicitation is out there for the PROGRAMMABLE electronic signs (noted here). Especially with projected car shuffling, you want CTA to keep paying for signs? As far as AC traction, that obviously has been killed, but other than shops personnel, I doubt that there are more than 3 people who care what kind of trucks it has. Why have they been paying? Either the route combinations change (i.e. would the Brown and Orange have the same equipment and hence same signs in the future?) or some new terminal (such as Jeff Park) is thrown in. After just having purchased 900 new signs for the temporary availability of Red Ashland-63, maybe someone figured it out. Especially with projected car shuffling, you want CTA to keep paying for signs? Hence, that's why I asked you why would they pay for signs. In my response to that post, I mentioned that they could recycle the old Mylar Curtain signs and use them on the 3200's if they assign any to lines that they have no signs for at this time. If they recycle the old signs, they aren't paying for them, all they're doing is adding them to the roll or making new roll sets from the old Mylar Curtains. They aren't going to need many mylar signs, once they digitize the #3200's signs, receive the #5000's and order the #7000's. Their just going to need sign rolls for between 320-350 cars on the blue line. (and any spares they wish to store) That is the point of this. There's no need to worry about digitizing the #2600's as those will be replaced by #7000's in the next 5 years most likely. It does make me wonder though if they intend on storing the #3200's after the #7000's are received or else what is the point of changing those signs either? As far as IRM not wanting #3200's because they have digital signs. They can always change them back to the original spec, once they own the cars they can change anything they want to change. They changed #2153-54 to trolley pole operation, so anything's possible. 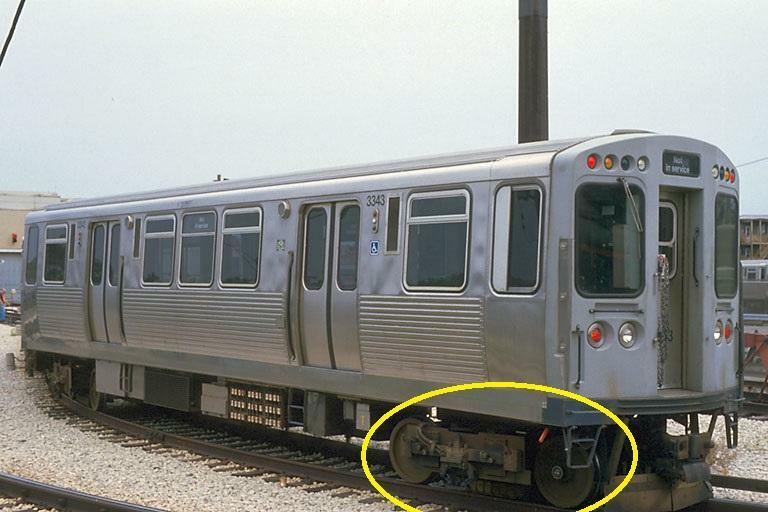 Remember these cars which are still on CTA property? They can be changed back to their original livery and interior design, but IRM has rejected them because they are altered too much from their original condition, which is a shame because they look nice and have been kept in good condition. The Mylar Curtains make the 3200's unique. It would be costly for IRM to remove the electronic destination signs from the 3200's and re-install Mylar Curtains back in, especially since they are becoming rare nowadays. Removing these could make IRM consider them "too altered" from their original condition and thus refuse buying a pair or two near the end of their time in CTA revenue service. I could see IRM taking a pair or two of 2400's because they are the first CTA railcars with sliding doors, which makes them unique. I don't see anything unique about the 2600's, so sadly they may all be scrapped without a pair or two saved. It's a coin flip about the 3200's if the Mylars are removed for LED destination signs. This was clarified in Addendum 3. There are several Q&A about each sign having a 3 position switch, but CTA accepted a variance (requested a number of times) in which one 3 position switch would be on the signs' main control panel. The sign control panel would then communicate to all 3 signs which set of 15 signs to display. I just made the factual statement that CTA has apparently replaced what appeared to be serviceable mylar signs since approximately Dec. 1, 2012, and hence may not want to make that expenditure repeatedly for the next, say, 7 to 9 years, until the 3200s are pop cans. Apparently CTA has gone away from the old practice of just taping new readings into signs, probably because that would foul up the mechanism. In any event, unless CTA withdraws this solicitation, you aren't going to get your wish. I'm sure the difference is the time frame...a couple of years for the 2600s compared to a minimum of 7 and probably 9 years for the 3200s. I agree with you that IRM can do what it wants, and that should not be the criterion on what CTA does. CTA didn't save the leather seats on the 2200s, for instance. Does anybody know what all 45 readings are? Knowing what readings are possible would give us an inside glimpse into the CTA's expansion priorities (for example a reading for 130th on the Red Line). As I understand it the readings now are each of the current terminals for each line, any relevant short turn stops, Not In Service and Express. There aren't any readings for wishlist line extensions this time around as far as I know. Somebody tried to lay them out here, although there seemed to be some omissions (such as Red 63-Ashland). As jajuan indicated, nothing future, although the pictures of the 3200s, when delivered around 1992, showed "Ford City." Those rolls are long gone. CTA is not in the business of making equipment capital investment decisions on the basis of what a railcar junkyard railfan museum might want 10 years from now. Did she just call IRM a junkyard?